A small westbound petrol station (and hot tub store) on the westbound A45. 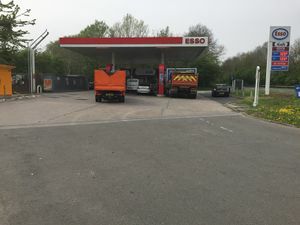 The by-pass here was built in the late 1950s, and the service station opened at the same time. The Allesley branch of Little Chef opened here in the 1960s, and closed in around 1984. It reopened in a new building in 1999 but closed within two years. That building became Mumbai Blue Indian Restaurant and is now the hot tub studio. The petrol station used to be branded Texaco, then Jet.